In mid-February I was fortunate enough to be able to reveal two tracks from the split tape between Twilight Fauna and Old Thunder, prior to it's release. I'm now sitting down to write my own review of the split. Bloodlines was only the second physical release to come from US black metal label Into The Night Records. It was a coming together of two solo-black metal projects from the Appalachian region of the US. I've featured Twilight Fauna's two most recent full-lengths on the blog already, including last year's "Hymns Of A Forgotten Homeland" but this split was my first introduction to Old Thunder. I really enjoyed Twilight Fauna’s most recent full-length and Ravenwood follows on from where he left off on his side of this split. Blood From Stone features gentle acoustic guitar and clean singing, almost similar in tone to that of the indigenous ancestors of his homeland. It’s a different yet logical change of direction that steers Twilight Fauna away from the raw black-metal of the projects early beginnings. After the calming entrance comes a harsher reality. A Revelation (Conceding The Scars) is nearly twelve-minutes of atmospheric black metal and you’d be forgiven for thinking that it was being played by a different artist all together, were it not for the familiar guitar tone that nestles underneath the feedback. The latter acoustic passage takes you back to calmer waters but there’s still an undercurrent of foreboding in the song as the volume builds again for a final tortured passage of eerie black metal. Old Thunder follows with two tracks and it’s the first time I’ve heard this band (apart from when I posted the stream, of course). An Inheritance Of Ashes begins with a considered build up of clean guitar and drums before a sludge-like layer of music accompanies the low growls of lone member DG. The song meanders through nearly nine-minutes of mid-paced black metal that sets a gloomy tone (in a good way). 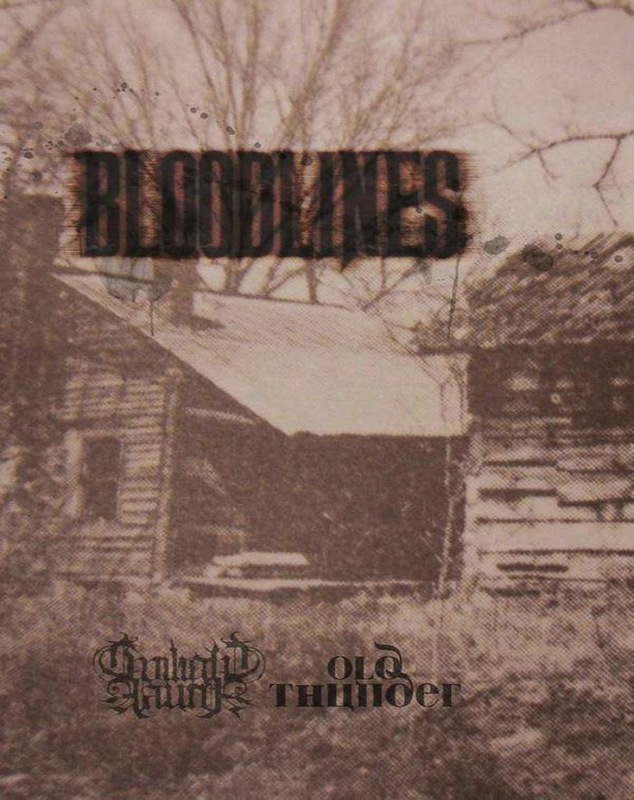 Old Thunder’s second song Burnt Bone Garland follows a similar path but builds upon the band’s post-metal laced sound. It’s slower and more claustrophobic. Only brief light is let into the music through subtle clean guitar. On Bloodlines you have two bands following different creative paths yet striving for the same thing. If you enjoy music, you’ll find beauty and meaning in whatever you listen to and this split is no different. While their appearances here may be short in comparison, both Twilight Fauna and Old Thunder have left plenty to love. That may sound soppy but I stand by it! This isn’t just black metal, this is heartfelt and creative music that transcends the genre limitation that was placed on it. All you have to do is immerse yourself in it! The tape release has been limited to just 65 copies. 50 standard copies of red tape and 15 very limited green copies, housed in a burlap bag with added extras (of which there are 5 copies remaining. You can purchase both editions of the tape or a digital copy from the above bandcamp page.